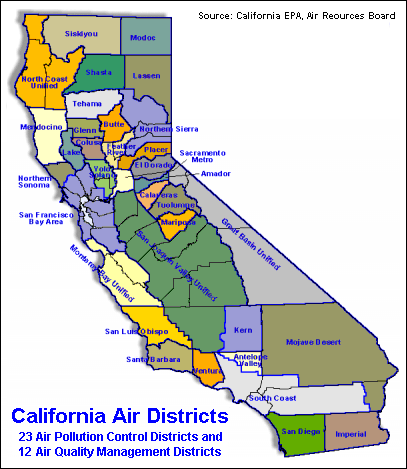 The California Air Resources Board, also known as (CARB) is the "clean air agency" in the government of California. CARB was formed in 1967 by combining the Bureau of Air Sanitation and the Motor Vehicle Pollution Control Board and it is a department within the California Environmental Protection Agency. The stated goals of CARB include attaining and maintaining healthy air quality, protecting the public from exposure to toxic air contaminants and providing innovative approaches for complying with national and state air pollution control rules and regulations. CARB is governed by a board made up of eleven members appointed by the state's governor. One having expertise in automotive engineering or a closely related field. One having expertise in science, agriculture, or law. One being a physician or health effects expert. The remaining three members are public members, one of whom must have air pollution control experience or fit into one of the above three specific categories. The Planning and Technical Support Division assesses the extent of California's air quality problems and the progress being made to abate them, coordinates statewide development of clean air plans and maintains databases pertinent to air quality and emissions. The Division's technical support work provides a basis for clean air plans and CARB's regulatory programs. This support includes management and interpretation of emission inventories, air quality data, meteorological data and of air pollution dispersion modeling. The Atmospheric Modeling & Support Section is one of three sections within the Modeling & Meteorology Branch. The other two sections are the Regional Air Quality Modeling Section and the Meteorology Section. AERMOD: Maintained by the U.S. EPA and available from their website. SCREEN3 and T-SCREEN screening models: Maintained by the U.S. EPA and available from their website. ISCST3: Maintained by the U.S. EPA and available from their website. CALPUFF: Development funded by CARB. Currently maintained by TRC Companies. CALINE-4: Maintained by the California Department of Transportation (Caltrans) and available from their website. CALGRID: Developed by CARB and currently maintained by CARB. SARMAP: Developed by CARB and currently maintained by CARB. ↑ Beychok, Milton R. (2005). Fundamentals of Stack Gas Dispersion, 4th Edition. author-published. ISBN 0-9644588-0-2. This page was last modified 00:02, 3 December 2011.